Sponsor a day - Info about "The Royal Marsden Hospital"
The Royal Marsden was founded in 1851 in Westminster by Dr William Marsden following the death of his wife, Elizabeth Ann, from cancer. It was the first hospital in the world to be dedicated wholly to the study and treatment of cancer. 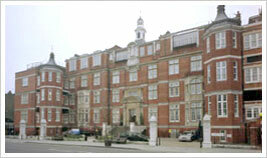 The hospital has two sites, one in Fulham Road in London and the other in Sutton. 40,000 patients from across the UK and abroad are treated at the hospital every year. The hospital's worldwide reputation as the leading cancer centre in Europe has been achieved with a successful record of innovation in nursing care, pioneering new treatments and the development of new anti-cancer drugs. The Royal Marsden provides extensive inpatient, day-care and outpatient facilities for all types of cancer, offering a full range of specialist services from critical care to rehabilitation.